Geek Lit Etc. : How far can a friendly dragon get in the world? 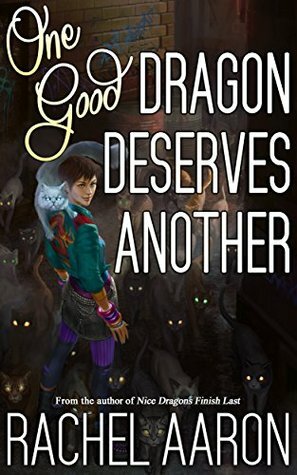 The nicest dragon in the universe slowly wins people over with his sincerity in Rachel Bach's One Good Dragon Deserves Another. Note: One Good Dragon Deserves Another is the second book in the Heartstrikers series. For the first book, Nice Dragon Finish Last, click here. Otherwise, read on! Well, he survived that ordeal, and made what might be his first actual friendships. Such a foreign concept for most dragons, but it just seems to fit with someone like Julius. And it's a good thing too: he's gonna need a little help from his friends coming up here. For you see, his mother doesn't exactly understand the idea of 'friendships.' She just sees potential influence points. And since Julius now has an 'in' with one of the Three Sisters Clan, he's finally become a useful pawn in one of his games. Because a potential mating flight between one of the Heartstrikers and a member of the Three Sisters could potentially put Bethesda in a position of consolidating clans, and perhaps expanding her power beyond even her own wildest dreams. But Julius has other problems on his plate as well. He's been working with Marci as something of a spirit and magical creature extermination company. In a place like Algonquin's Detroit Free Zone, there's plenty of magical critters and the like that need to be taken care of, and the magically-deprived average human hardly has the resources to take care of a tank badger squatting in their apartment. It hardly takes all of the magic that Marci, and Julius have at their disposal, and so it's certainly a way to keep the lights on. Any magic using human in the DFZ, especially one with draonic ties, is going to end up drawing unwanted attention to herself. After a silly fight with Julius, Marci ends up on the wrong end of a curse placed on her by Algonquin's dragon hunter: bring the dragon to the appointed place by sunset, or the Sword of Damocles curse will, appropriately, sever her head from her body. Plus, her ghost 'cat' has drawn the attention of the Heartstriker's planeswalker, so there might be even more to him than anyone realizes. And if that wasn't enough, the Heartstriker's seer is back in action. As he looks over the futures of his clanmates, their futures are simply...disappearing. That's probably not a good sign. So many possibilities are opened up in this book, and Aaron does a fantastic job turning from one plotline to another. Balancing an ensemble cast is a knack that few authors master, but it's done here so seamlessly that the reader doesn't realize how masterfully it's done until he looks back at it as a whole. And any time the craft of writing is eclipsed by the story, its a good time. Highs: I love Marci's storyline, and the revelations of her spirit are spot-on. Lows: There are so many open storyline threads, I can't imagine all of my favorite asides wrapping up in just one more book, if this is intended to just be a trilogy. 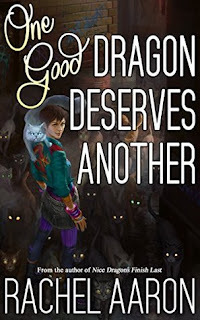 Verdict: One Good Dragon Deserves Another is a satisfying enough book on its own but, like all good serials, leaves the reader itching for that next piece of the story.